I dropped something down the lint filter area....help! If your drum belt looks like either of these....change it!! Most Kenmore dryers are built with the Inglis/Whirlpool design. 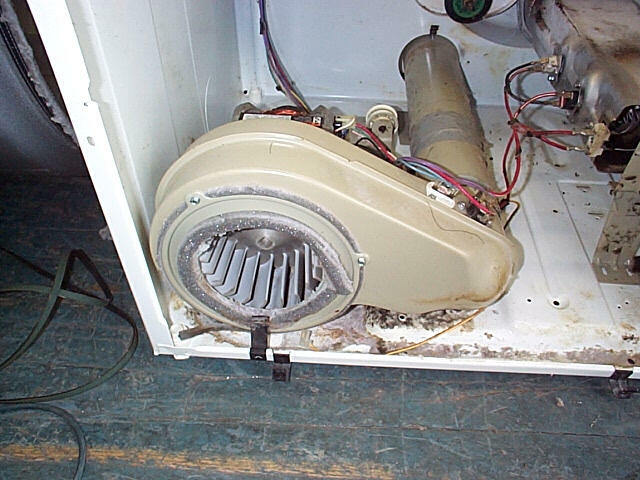 For "low heat" complaints or "taking too long to dry" complaints, always check the venting system first. Do not go outside and put your hand under the vent opening and say " it is fine - I feel air coming out"...that is not good enough...take your venting apart, clean it ALL out from the dryer exit to the outside!....and make sure the vent hood flapper works and that it is not clogged with lint. 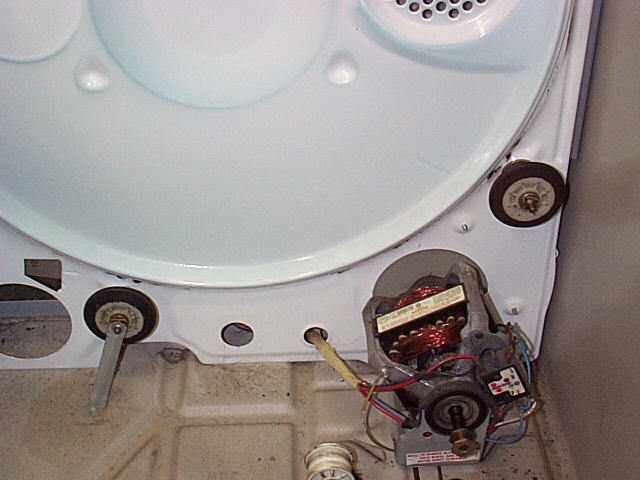 Electric dryers - See the "how to take apart" section first if needed. 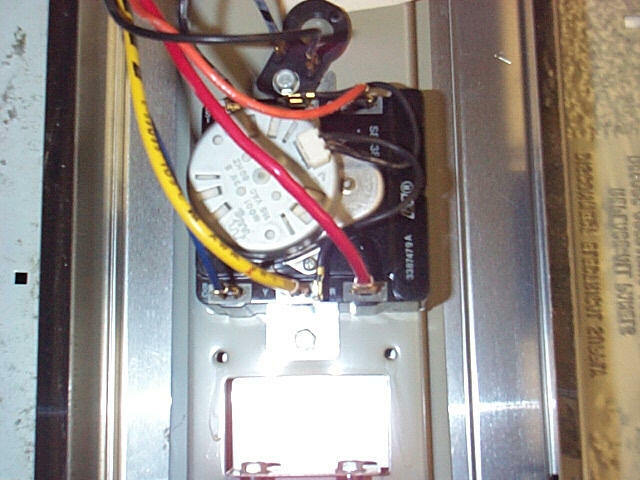 Always check the power supply first...if one house fuse blows or 1/2 of the breaker trips, it is possible for the dryer to run with no heat. If you have a volt meter, you should read 240 volts between the red and black wires, 120 volts between the white and black and 120 volts between white and red, check for this at the main power connection. 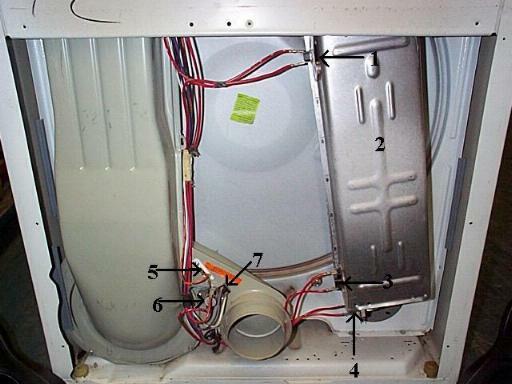 If you have 240 volts to the dryer, remove rear access panel, turn dryer on and test for 240 volts to the *heating element wire connections (#4). If you have 240 volts there and no heat = bad element, the element must be broken physically to be bad. 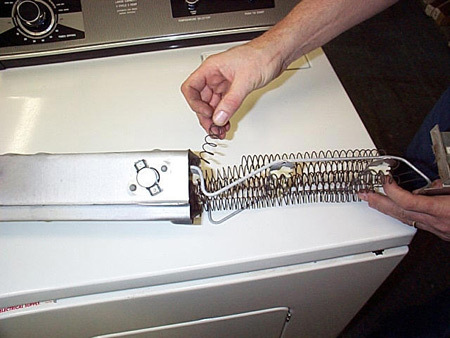 If you have no power at the heating element, remove power, remove wires to the heating element and isolate them so that they can't touch anything. 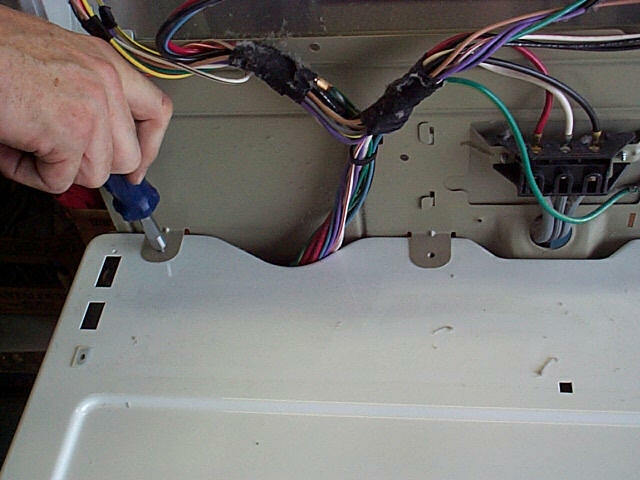 Reinstall power and check each wire for power from the wire to the dryer cabinet, one wire will probably show 120 volts and the other will show zero. 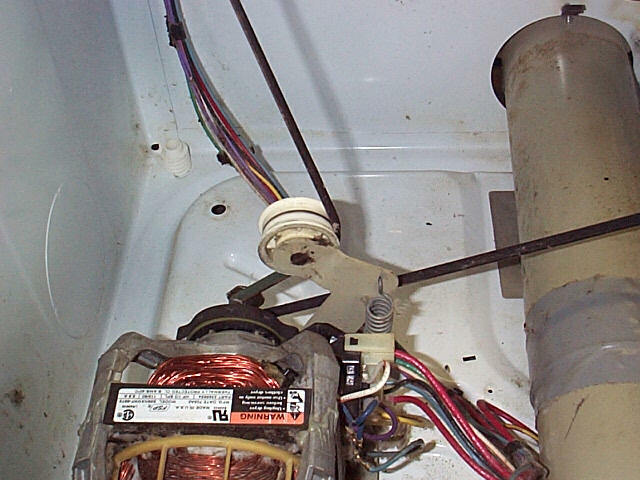 Make note of the color or # of the wire that has no power, remove power to the dryer and check the wiring diagram that comes with the dryer to find out where that color or # wire goes to. EG: - wires might be yellow and red, if the yellow wire (example only) was the one that had no power, look at the wiring diagram to find out where that goes to and check only those parts, no need to check the other colored wire parts as they are working. Things to check are, * thermostats, timer contacts, selector switch, motor switch heat contacts ( 1&2 on the motor switch ) and * thermal fuse. If the wires to the heating element are the same color, just remove power after test and slowly follow that wire that has no power with your hand to see what parts it goes to. If live volt testing scares you, try the ohm check instead. *#1-Thermal fuse that controls heat. If the dryer overheats, this fuse will blow. One shot fuse. Does not reset. #2-Canister for the heater element. #3-Hi limit thermostat. This thermostat is a safety thermostat in case the dryer severely overheats. When this safety thermostat is defective, it should raise a red flag for air flow problems. 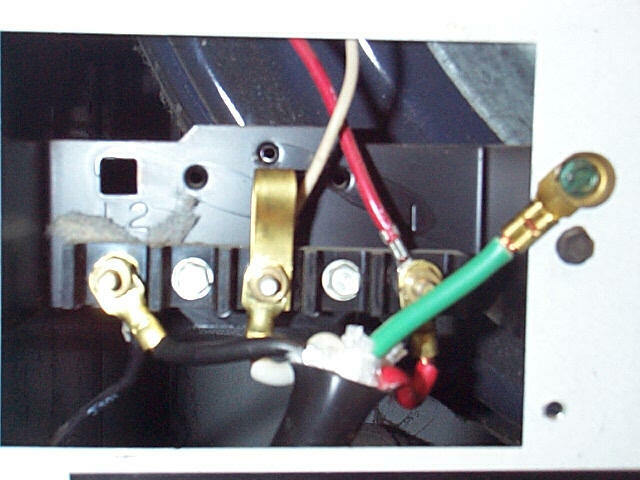 #4-This is the terminals of the heater element that is inside the canister. #5-Thermal fuse that controls motor run. #6-Control thermostat. This is the thermostat that controls the cycling of the heater in high heat mode. #7-Heater for low heat. When you select low heat, 110V is sent to this heater that the control thermostat sits in. The heater helps cycle the control thermostat faster, therefore you get less heat than the high heat mode. Disconnect power first. First see the "how to take apart" section. The drum will remain in place, the top panel will be lifted up against the wall and the top of the front will have to be pulled forward to slip the belt around the drum ( ribs toward the drum ), loop belt around idler pulley and motor pulley, reinstall front and top and slowly turn drum one turn to line up the belt. This should also help you out. 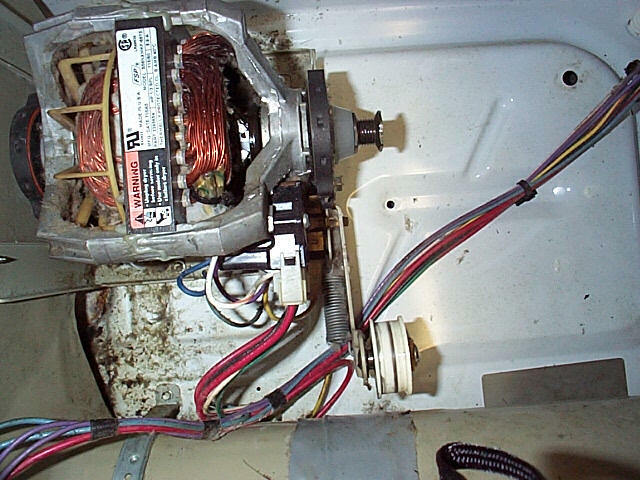 You will find the safety thermostat attached to the heating element cover, the operating thermostat(s) are on the fan blower housing. How do dryer thermostats work? 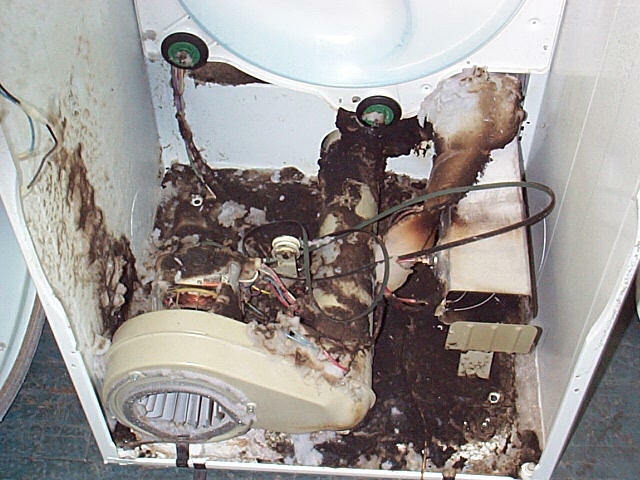 Be sure and unplug the dryer before starting repairs. Electricity is very dangerous. Be Safe. 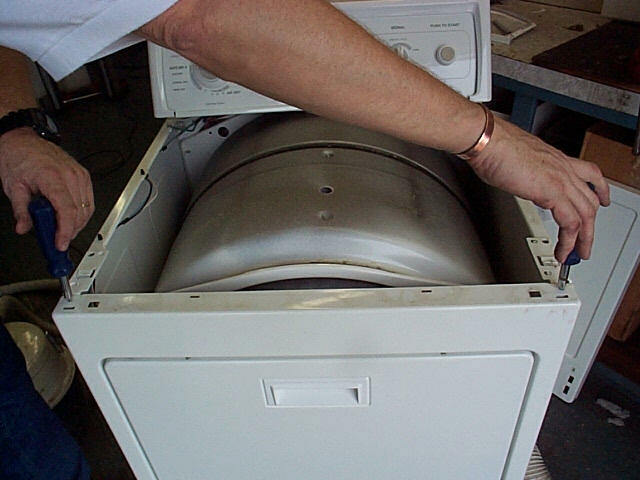 The first step in disassembly of this dryer is to remove the bottom panel. Use your back button to return here after viewing the pictures. The heater element, high limit thermostat, thermal fuse, and the cycling thermostat can be serviced with the bottom panel off. There are two clips to be pressed in about 4 inches in from the side at the top of the panel. Press on these clips, pull out on the panel and lift it off a couple clips it mounts on. To continue disassembly, pull out on the plastic end caps on either side of the control console. They are a press fit and will pull off. Take hold of the bottom of the end cap and pull on it. Remove the 2 screws under the end caps holding the control panel. 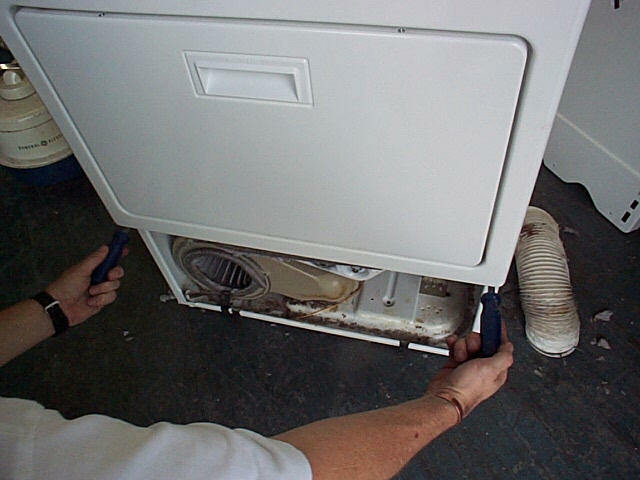 Lift the panel and hinge it to the back of the dryer. Remove the 3 screws visible under the control panel holding the top down. Slide the top of the dryer forward toward yourself. It will disengage clips on the cabinet for removal. 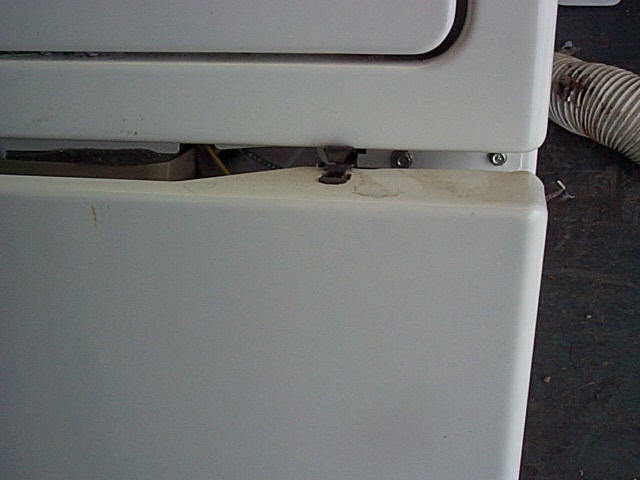 Remove 2 screws holding front to top of the dryer. 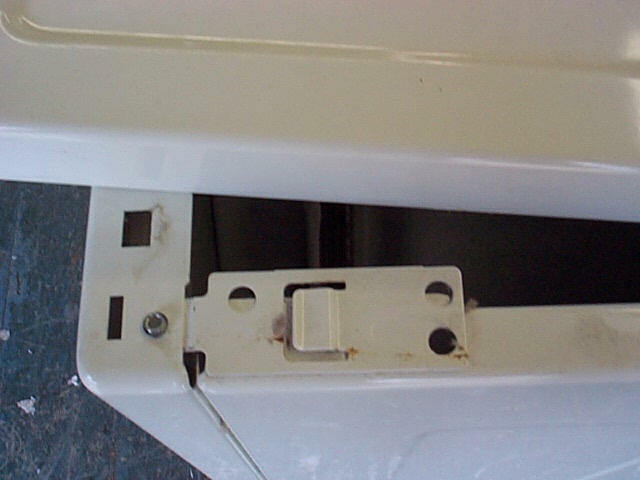 Remove 2 screws below the door holding front to dryer. Disengage the clamp holding the air duct to the blower housing. Take the wires off the door switch. 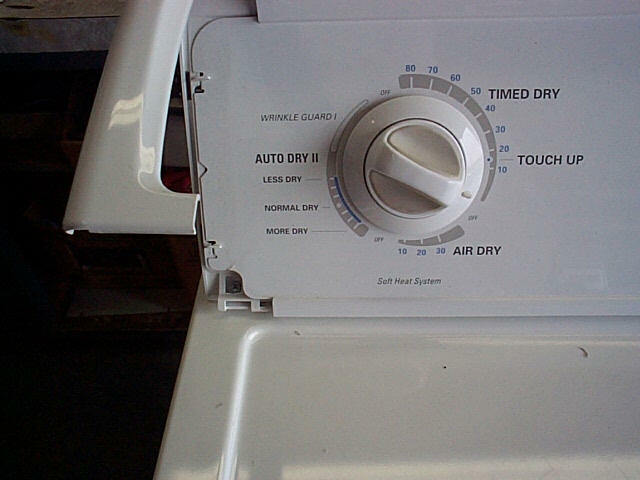 Take the wire off the sensor if your dryer has one. Remove complete front from dryer. 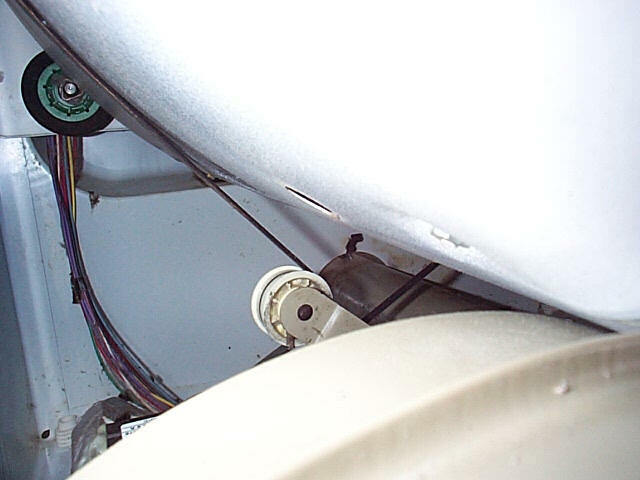 You must release the belt from the idler pulley to get it off the motor pulley to continue the disassembly. Put both hands into the area of the motor and feel how the idler pulley is spring loaded against the smooth backside of the belt. You can't see this well, so feel it and remember how the pulley is against the belt. Pull the idler away from the belt and take the belt off the motor pulley. You can now lift the drum from the rollers it rides on. This picture shows the thread of the belt with the drum removed so you can get a good idea of how it threads. The front rollers are on the front you have already removed. You can repair the rollers, heater element, thermostats, motor, and blower at this point. You must hold the pulley end of the motor shaft to get the blower off. The blower screws onto the end of the motor shaft. I have found that a 1/2 inch socket extension will fit right into the center slot of the blower . Turn the ratchet clockwise to loosen the blower wheel. Reverse this to tighten. 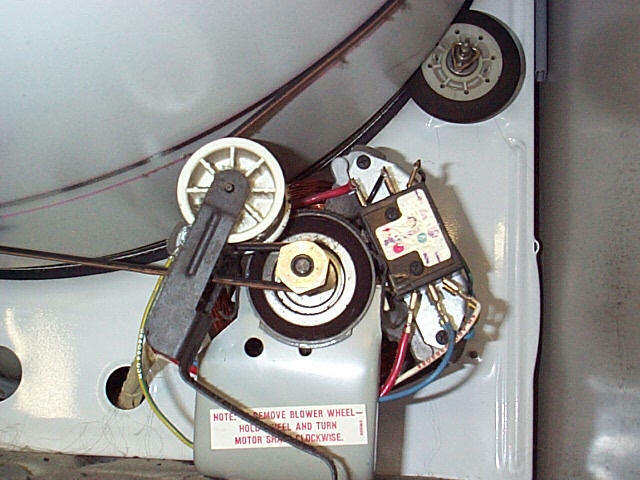 This dryer also has a belt broken switch that will not let the motor run with a broken belt.